Elspeth Beard specialises in creating or remodelling interesting and unusual buildings, both old and new. When working with old buildings, she likes to give them a new lease of life by mixing conservation with contemporary design; the clean lines and modern feel of new elements contrasting with the original features of the existing building. 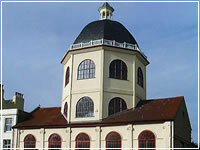 Much of her work involves the conversion of listed buildings such as water towers, lighthouses and barns into striking and unique family homes. She also creates all kinds of new houses, varying from traditional timber-framed constructions to modern buildings with rendered walls and large areas of floor-to-ceiling glass. Elspeth works on sites and buildings of all sizes, but whatever size they are, she likes them to be out of the ordinary. She can provide a comprehensive service from the initial design stage right through to the completion of works and is happy to give clients as much (or as little) involvement in the whole process as they desire. 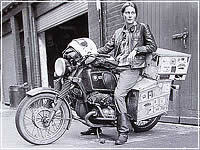 Elspeth Beard has won numerous awards, starting with the ones she received for her first solo project, the Munstead Water Tower which is currently her home. This hundred-year-old building had been derelict for decades when she took the huge gamble of buying it at auction without planning permission or listed building consent. Circumstances dictated that she had to move in when it was barely habitable, but after seven years' hard labour the quality of her work can be judged from the numerous magazine articles and TV programmes which have featured the tower, including Channel 4 TV's Grand Designs. 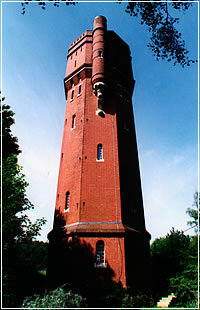 To date, the Munstead Water Tower has won no fewer than five architectural awards. The building was awarded The Surrey Historic Buildings Trust Award in 1993, The Downland Design Award in 1994, The RIBA Regional Architectural Award in 1994 and only last year The Surrey Historic Buildings Trust 25th Anniversary Best Conservation Award. 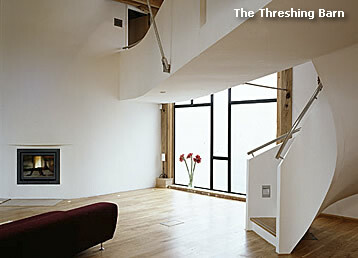 The main subject of the Channel 4 Grand Designs programme was the award-winning Threshing Barn. Other projects of note include the historic Worthing Dome cinema, a contemporary family home Chalk Hill, timber-framed houses Wishanger Lodge and Chalk Dell, a historic Philip Webb property West House, Chelsea, Burnham-on-Sea Lighthouse and Cawston Water Tower. Elspeth does not limit herself to any particular type of project or building - her only requirement is that they should fire the imagination. Chalk Hill is a new family dwelling in Guildford occupies a hillside location with panoramic views over the valley of the river Wey. The new dwelling retains the original elevated living room ‘box’. The project won the Good Design Award from the Guildford Society and was a runner up for the Building of the Year in The Guildford Style Awards in 2006. The contemporary design of Farnham Park Lodge sits well within its surroundings and has transformed what was previously just an unsightly 1960s brick bungalow. 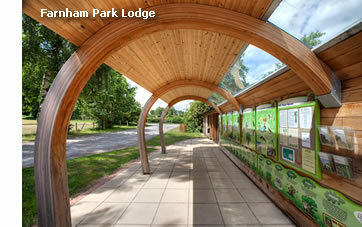 The project was formally recognised in the Highly Commended Category of the Farnham Society’s 2010 Amenity Awards. 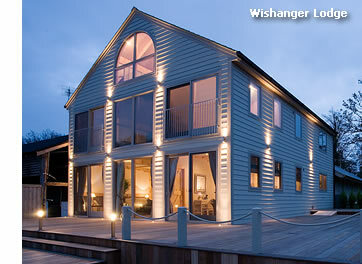 Wishanger Lodge is a new timber framed house in Surrey. One of the main advantages of this timber frame was that it was produced off site and arrived in 'kit form'. It was built in just 14 weeks from start to finish. The Wishanger Lodge frame is made from eastern white pine, a sustainable Grade A timber. It is held together by oak pegs in traditional mortise and tenon joints. 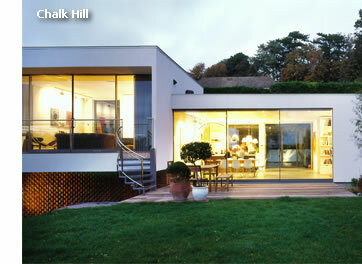 The house was featured on the cover of Self Build magazine in April 2006.